In this workshop we will take a look at the various structures that make up the low back and hips. You’ll learn different yoga poses that strengthen and stretch to help with hip and low back tightness, combat sciatic nerve issues, SI joint pain, and that will help relieve pain in your low back, hips, and glutes. In addition to yoga poses, we will also be using tennis balls, lacrosse balls, and foam rollers to help with self massage for different parts of the hips, glutes, and upper legs. Make this a 2 part series workshop with Yoga Poses for a Healthy Upper Back and Shoulders (February 10th). See more event details and updates on Massage & Yoga Portland’s Facebook. Come in comfortable clothing, ready to move around. You’ll also want to bring a yoga mat and a sock. Space is super limited, so be sure to sign up fast! This workshop combines the benefits of restorative yoga with hands-on massage for the ultimate self care and relaxation experience. Yomassage™️ includes hands on massage from a licensed massage therapist (me! ), guided self massage with lacrosse and tennis balls, and hands on adjustments. Each workshops is 75-90 minutes long and has a limit of 5 students per class, so you will have plenty of hands on massage time. Limited spaces available! Sign up today online to reserve your spot! See more event details on Massage & Yoga Portland's Facebook. Yoga goals. We all have them. Whether that means mastering a gravity-defying pose you saw on Instagram or making your yoga practice a consistent part of your everyday life, your goals are achievable. You have everything you need to succeed—you just don’t know it yet. To tap into this power, join Samantha Higgins and Karli Petrovic for this 90-minute workshop. Ready to get started? Reserve your spot by sending a PayPal or Venmo payment to Samantha Higgins or Karli Petrovic. If you don't have an account, please email Karli.a.petrovic@gmail.com. We will have Square card reader for credit card payments on the day of the workshop. If you email ahead of time to secure your spot, we will waive the $5 day-of registration fee. To evolve is our nature. Join us to evolve in the magical natural setting of Koh Samui at Vikasa Retreat. You work hard, constantly, juggling the many responsibilities of life -- rain or shine. You deserve to escape the ordinary for a few days and recharge your soul on an eight-day, all-inclusive yoga retreat this summer. Beach: check. Thailand: check. Chef’s table: check. Wellness: check. Vikasa Yoga Retreat is owned and operated by a student of Guruji Andrey Lappa, who is the founder of Universal Yoga. Vikasa yoga retreat is set on a spectacular ocean cliff. With breathtaking sea-views from yoga shalas, private rooms, infinity pool, and restaurant, soak in nature with all creature comfort. You might make discoveries here that can be the beginning of a major shift in your lifestyle. And you will definitely meet some amazing people and make some new friends for life. Rest well in the rooms of Coral Cliff Beach Resort. 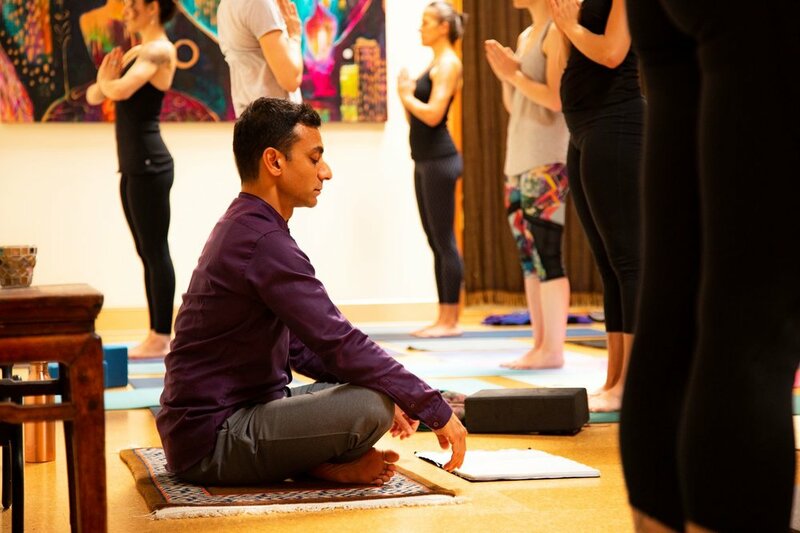 Experience Universal Yoga in Mandala classes, along with meditations, partner energetic practices, dharma teachings, and time for introspection with international yoga teachers, Raj Patra and Tommasina Lash. EXCLUDED FROM COST: Airfare, Visa ($25 upon arrival in Kathmandu), travel insurance, personal & shopping expenses, hotel & trip staff gratuity, alcoholic beverages. The majority of time spent in this module is designed to educate you on Universal Yoga lineage and principles that will also prepare you for training with Dorje Andrey Lappa. Whether you choose to do so or not, your yoga knowledge will dramatically increase and you will be eligible to move forward towards Yoga Alliance certifications in the future. In this workshop we will take a look at the various structures that make up the shoulders and upper back. You’ll learn different yoga poses that strengthen and stretch to help with shoulder tightness, combat poor posture, and that will help relieve pain in your upper back, neck, and shoulder blades. In addition to yoga poses, we will also be using tennis balls, lacrosse balls, and foam rollers to help with self massage for different parts of the shoulder girdle and upper back. Make this a 2 part series workshop with Yoga Poses for a Healthy Low Back (February 24th). Take a journey with Yoga for Life and Raj Patra to witness ancient traditions and practices of yoga on this rare adventure through Kathmandu where you will touch the sky of spirituality, encounter sadhus, yogis and lamas, visit World Heritage Sites, and witness life inside the Vajrayana monasteries and simple villages which preserve this ancient way of life. Hike up Himalayan trails above the clouds to ancient caves, and sit on the same boulder where Buddha himself once sat. Discover why Nepal is a constant source of inspiration for curious globetrotters and yogis, and stay at serene resort of Hotel Vajra, with organic garden and farm-to-table food. Join us for a fun evening to fill your belly with fresh, home cooked food, your soul with good company, and your brain with yogic wisdom. Free and open to the YFL community. The film is family friendly so all are welcome! Bring a dish of your choice to share, or show up and be taken care of. We've got you covered. Email info@yogaforlifepdx.com with any questions. Have questions about specific yoga poses? Want to know how to progress your own practice but not sure how? Join us on Saturdays from 3-4:30 for our "Open Lab" where you can receive one-on-one adjustments and advice from our knowledgeable teachers. This will include personalized adjustments and alignment cues, short sequences you can take with you for your home practice, and help getting into that pose you've always wanted to get into. Join fellow Universal Yogi from Seattle, Alexandra Rosenblum, for a special mandala practice on Sunday, March 3rd from 8:30-11:30 am. Sign up online here to have your very own experience of Universal Yoga. Discover the full effects of dynamic, intelligent asana sequencing combined with pranayama , mudra, mantra and visualizations. Deepen your practice in the most profound of of ways as you experience the post effect that a truly balanced practice can create- in the mind, body and spirit. This is a 2 hour workshop to learn how to massage your infant. You will learn how to soothe gas, colic, ear aches, and so much more! There will be time to have open discussions and conversations, without judgement, about early childhood behaviors, parenting, and more. This workshop is open to any and all moods of baby and parent or caregiver. Crying is a natural and common state for infants and is always welcome and encouraged in each class. There will be plenty of breaks during the workshop to help with comforting your infant, feeding times, changing diapers and anything else that may come up within the 2hrs. A large part of this workshop is about relaxation and centering yourself to respond to your infant's individual needs. Each parent/caregiver will get a bottle of olive oil to use for massage during the course and at home. Not a parent yet, but expecting?? You are also welcome! Just bring a plush body doll to practice on for classes. “Quiet mind, and open heart, that is the secret to human evolution,” says world-renowned Guruji Andrey Lappa, who is the founder of Universal Yoga, and a scholar of Hinduism and Buddhism at Karma Leksheyling Monastery in Nepal. It is not every day that you get to meet and ask questions to a Vajrayana Lama and self-realized Master from the Himalayan mountains at your backyard yoga studio. Why are we here? What is the future of mankind? How did yoga begin? Here is your opportunity to be part of an effort to evolve our minds and open our hearts through our understanding of yoga and spirituality in an hour-long Dharma Teaching at Yoga for Life. Join us Sunday, February 3rd, from 4-5 pm where you can learn answers to the questions you are searching for from a self-realized Master, Guruji Andrey Lappa. The Level 2 training is a 10-day intensive will teach you to master Mandala Sequencing techniques, along with incredible personal practices and Kriyas. Guruji Lappa’s Universal Yoga program is a Yoga Alliance Accredited 300-hour advanced program and successful participants (who already have a 200-hour credential) can receive a 500-hour certification. The coursework will be co-taught with Raj Patra. PREREQUISITE: Level 1 coursework completion, or equivalent education from senior Universal Yoga teachers. TUITION: $1,800. An additional $100 is required for examination, grading, and certification process for each level. The cost is $280 for all 4 sessions or $90 per session. Purchase all 4 sessions for $280 here. Purchase a single session here.